A title applied to "a Temple trustee superintending the cashiers" (Jastrow, "Dict. "; see Sheḳ. v. 2). While the three—or, according to Baraita, Tamid, 27a, thirteen—cashiers (gizbarim) handled all the money that flowed into the Temple treasury, "the amarkolim, seven in number, held the seven keys to the seven gates of the Temple hall ['azarah], none opening his gate before all the others had assembled" (Tosef., Sheḳ. ii. 15, and Yer. ib. v. 49a). Above the seven amarkolim were two catholici, and these again were under the supervision of the high priest (Yer. Sheḳ. v. l.c.). Abba Saul ben Batnit, in his bitter attack against the priestly house of Ishmael ben Phabi, says: "They themselves are high priests, and their sons gizbarim, and their sons-in-law amarkolim" (Tos. Men. xiii. 21, Pes. 57a). In Targ. Yer. to Num. iii. 32, and Num. R. iii. Eleazar, the son of Aaron, "the chief over the chiefs of the Levites," is given the title of Amarkol. Eliakim, the son of Hilkiah, as keeper of the keys of the Temple is also called Amarkol, in Targ. Isa. xxii. 23, and Jeremiah ben Hilkiah is represented as a descendant of the amarkolim, who hadtheir inheritance in Anathoth (Targ. Yer. i. 1). In addition in Zach. xi. 13 (A. V., the potter) is translated in Targ., Amarkol = treasurer. Büchler has shown (against Schürer, "Gesch.," 1st ed., ii. 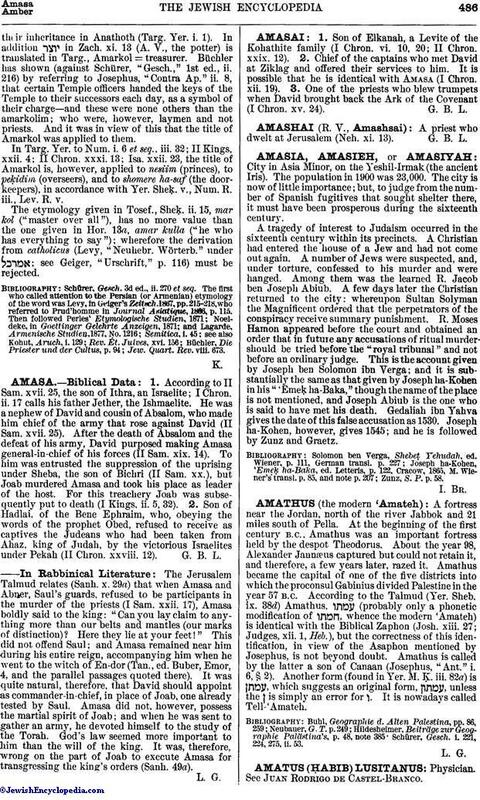 216) by referring to Josephus, "Contra Ap." ii. 8, that certain Temple officers handed the keys of the Temple to their successors each day, as a symbol of their charge—and these were none others than the amarkolim; who were, however, laymen and not priests. 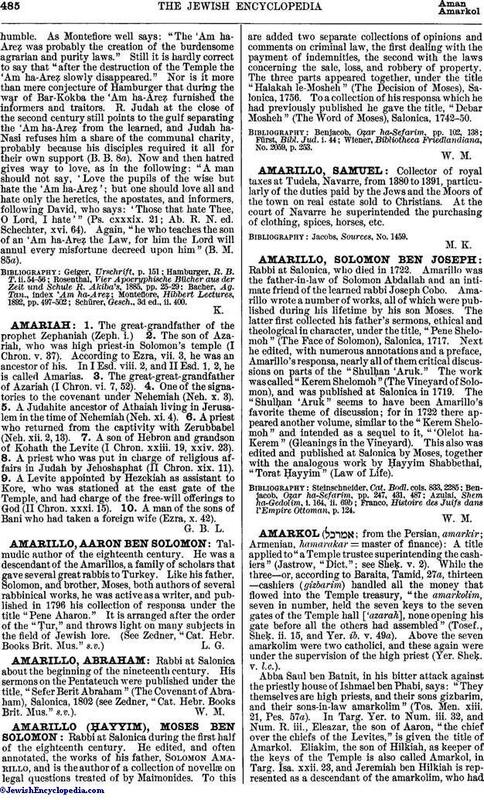 And it was in view of this that the title of Amarkol was applied to them. In Targ. Yer. to Num. i. 6 et seq., iii. 32; II Kings, xxii. 4; II Chron. xxxi. 13; Isa. xxii. 23, the title of Amarkol is, however, applied to nesiim (princes), to peḳidim (overseers), and to shomere ha-saf (the doorkeepers), in accordance with Yer. Sheḳ. v., Num. R. iii., Lev. R. v.
The etymology given in Tosef., Sheḳ. ii. 15, mar kol ("master over all"), has no more value than the one given in Hor. 13a, amar kulla ("he who has everything to say"); wherefore the derivation from catholicus (Levy, "Neuhebr. Wörterb." under ; see Geiger, "Urschrift," p. 116) must be rejected. Jew. Quart. Rev. viii. 673.